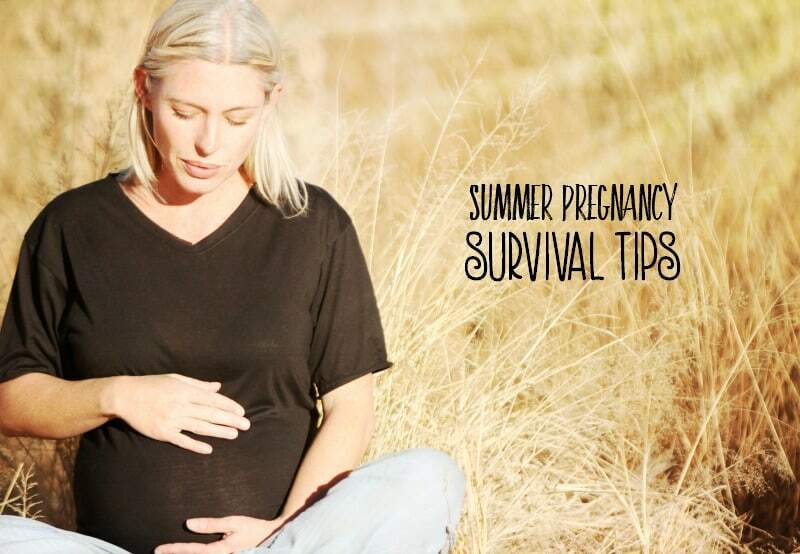 Looking for a summer pregnancy survival guide? Sweet B was born in July, so I wasn’t pregnant for too long with her during the summer. Squeaker, on the other hand, was born in December. So I went through two full seasons being pregnant. There are definitely somethings that I miss about pregnancy and somethings that I don’t miss. 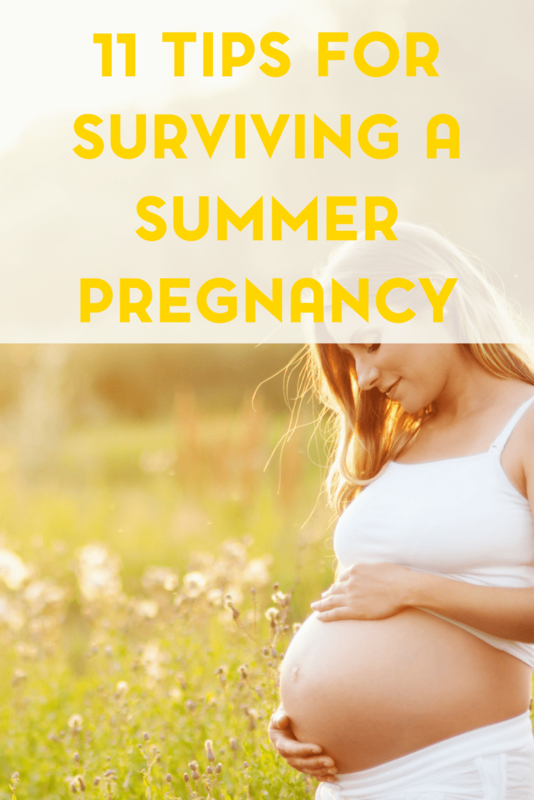 Being pregnant during the summer was not always fun so I wanted to share my tips on motherhood for surviving a summer pregnancy. Some might seem pretty practical and general for getting through the summer. And if you’re looking for more pregnancy tips, don’t forget to check out my Motherhood Resources and Inspiration. 1. My very first, and most important tip, make sure you’re drinking enough water. I always had a water bottle with me and would refill it at least three times a day. Yes it was sometimes annoying because it meant so many trips to the bathroom, but it was worth it. It’s important to stay hydrated anyway during the summer but when you’re pregnant it is really easy to get dehydrated. Trust me, I’ve been there… and it’s not fun. Once you start to get dehydrated your body will react. I got cramps and ended up in the hospital to get treated with an IV. You could have multiple water bottles- for example put one in the freezer, one in the fridge, and then use them on a rotational basis. 2. My next tip is to find comfortable and loose fitting clothing. Have you seen my maternity essentials for a comfortable pregnancy? Most of the suggested items can be worn year round. And if you’re at home, and by yourself, there’s really nothing with walking around naked. I’ve done it. A friend of mine has done it. All that really matters is that you’re comfortable. And so long as you aren’t expecting company, who cares? 3. Another essential tip is to avoid the sun during peak hours. Most of us should try to do this anyway and if you must go outside, be sure that you’re wearing a good sunscreen, floppy hat, sunglasses… etc. Do whatever you can to protect yourself from the sun. 4. Another tip, take lukewarm showers instead of hot showers. This will help cool down your skin. Don’t take cold showers though because that could possibly send your body into shock. If you can tolerate it, another thing to try is a lukewarm bath. 5. Try cold compresses or even plastic baggies filled with ice cubes for quick relief. Place where needed, and as necessary, to help cool yourself down. You can, of course, also try ice packs. 6. Keep a glass of ice chips/ice cubes next to your bed at night. This could be in addition to, or in place of, your usual water. But having that cool drink will definitely help. Being pregnant in the summer is not any woman’s favorite activity. And then there’s being in your third trimester during the summer. Women who have survived summer pregnancies and lived to tell the tale, usually do so with lots of drama. I know that’s definitely been the case for me. And for those who are pregnant for the first time? It can be downright scary to hear about how awful it supposedly is to be pregnant in summer, especially near the end of your pregnancy. How can you skip the drama and enjoy your last summer before baby arrives, instead of using your time suffering from the heat? This is a great activity to organize when the weather is too hot to bear, and you are already feeling the extra heat of carrying a baby. Plan a pool party and invite your friends, or better yet, your fellow pregnant mamas. You will all be relieved to take a dip in the pool and cool off at this time of the year, and time of life where heat seems to be abundant. Even wearing minimal clothing, such as your bathing suit, helps you cool off and enjoy the summer a little more. In order to properly cool off, our bodies need plenty of liquid. Water is your first choice, but there are many ways to up your intake of it without drinking it plain. Use this time to try out as many new beverage recipes as you want. Make herbal tea, cool it off in the fridge and add a few ice cubes and a little apple juice to make a refreshing and tasty drink. Blend frozen juice concentrate with ice cubes and water to create a slushy without the added sugar. Keep the recipes fun and you will find it is easy to consume the liquid you need. When the outdoors is too unbearable, go indoors for some entertainment. Late pregnancy is a great excuse to head to the movies or to your favorite shopping mall. The air conditioning will give you a nice pick-me-up and help you to get through the rest of the day. Avoiding the heat during peak times keeps you from feeling overwhelmed and exhausted. If you can’t be near an air conditioner, try keeping a mini fan with you. Since it is summer and you will likely be showing off those toes in sandals, why not head to the local salon and get a pedicure? The break will feel great, and the foot massage most salons include feel heavenly on feet that are retaining water and are tired from carrying extra baby weight. Most massage therapists offer their services to pregnant women, and some even cater specifically to expectant moms. Find a reputable massage therapist, settle down and enjoy a pregnancy massage. This can help ease swelling, soothe strained muscles, and is a nice break for a busy mom-to-be. Summertime brings intense heat, which can feel brutal to an expectant mother and especially in her final stages of pregnancy. These ideas will give you some relief, and allow you to beat the heat while enjoying this very special time in your life. On a budget? Try these cheap ways to beat the summer heat. 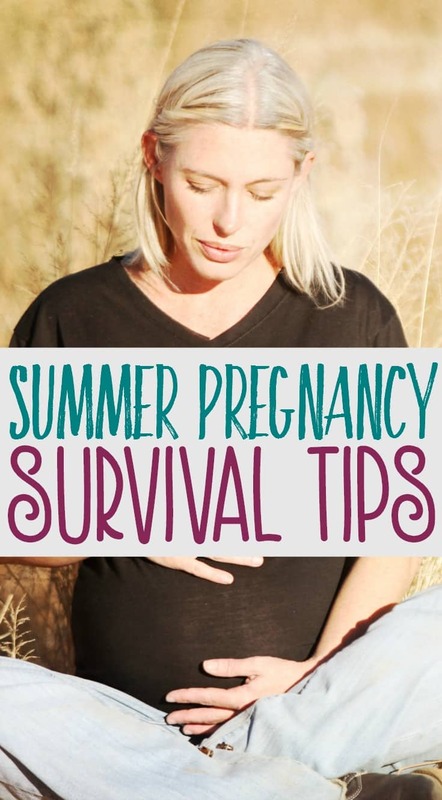 Hopefully these tips will help you with surviving a summer pregnancy. Oh m goodness, I’m totally in the same boat this summer! My second is due in August and crazy TN heat or not, this pregnancy has been harder from the get go! I’m always amazing how quickly I can overheat in this weather (erm and it’s not even officially Summer yet!) despite drink plenty of water and taking it slower. Braxton Hicks are go from the moment I waddle outside! Great list! 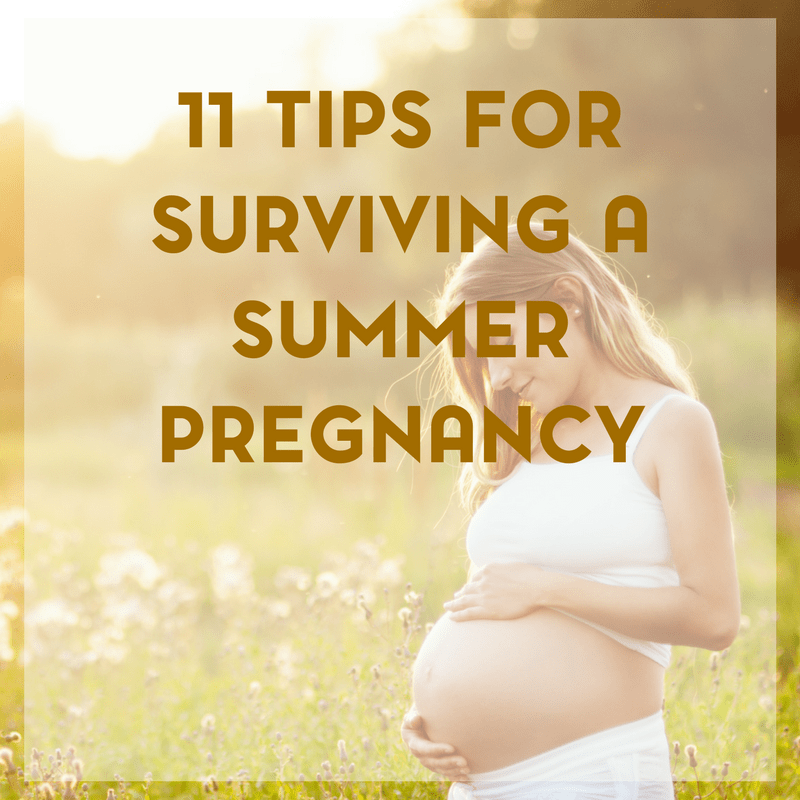 I had my kiddo in July last year, and it really can be rough to have a summer pregnancy. You are already miserable, and you add sweltering heat to that it’s rough. Thanks for sharing!